The widespread utilization of virtualization has been one of the most pronounced trends in networking. Organizations are turning to virtualization in an attempt to reduce the costs associated with managing and deploying hardware devices. Microsoft Hyper-V environments have become some of the most important components of networks. The rising use of virtualization has made Hyper-V monitoring a necessity. While virtualized infrastructure helps to reduce costs it can be more complicated to monitor virtual machines without the proper equipment. Using Hyper-V monitoring tools allows users to monitor the performance of virtual infrastructure just as they would a physical device. In this article, we’re going to look at some of the best Hyper-V monitoring tools and software on the market. 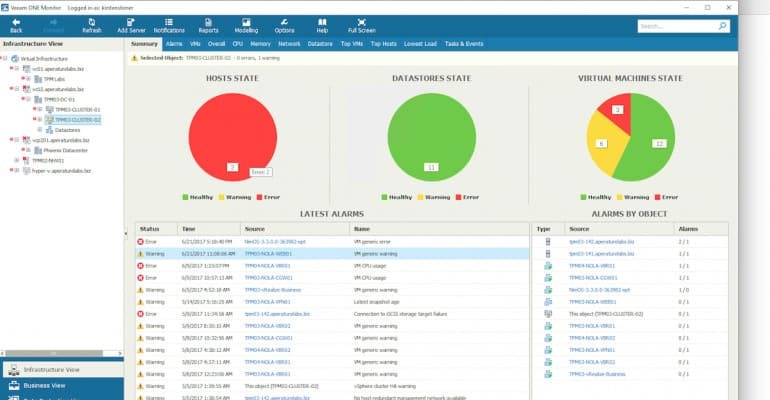 SolarWinds Virtualization Manager is an infrastructure monitoring tool that offers a robust Hyper-V monitoring system. 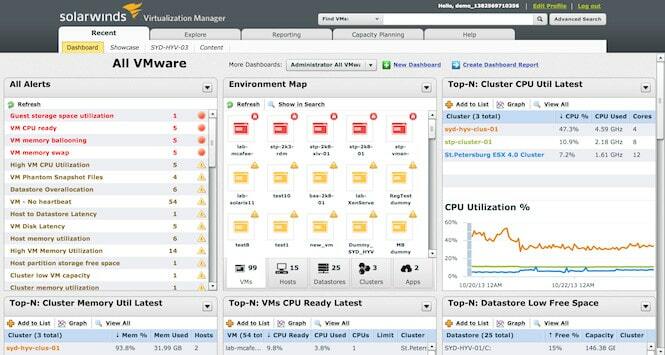 With SolarWinds Virtualization Manager you can track storage I/O performance. Tracking storage I/O performance allows you to address storage I/O contention, which is one of the most common issues with managing Hyper-V environments. The main dashboard is fully customizable and can be used to view current alerts and warning messages so that you keep up-to-speed with developments in infrastructure performance. There is also a VM Sprawl dashboard which allows you to keep track of key metrics like CPU, memory, and storage. You can see how much total storage space you’ve used. Alerts are one of the main ways that SolarWinds Virtualization Manager helps you to track Hyper-V performance. For instance, you configure the program to send you an alert when CPU utilization is too high. This ensures that you don’t miss anything important and risk your VM going down. If you’re looking for a low-maintenance Hyper-V monitoring tool then SolarWinds Virtualization Manager is one of the best tools that money can buy. SolarWinds Virtualization Manager can be purchased for a price of $2,903) (£2,275). There is also a 30-day free trial version available. PRTG Network Monitor is another product that is great for monitoring Hyper-V hosts and virtual machines. Metrics that you can track with PRTG Network Monitor include traffic, CPU load, virtual memory, and critical status values. However, there a range of Hyper-V sensors that you can use to monitor your virtual infrastructure. Sensors available on PRTG Network Monitor include Hyper-V Host Server Sensor, Hyper-V Virtual Machine Sensor, and Hyper-V Virtual Storage Sensor. With Hyper-V Host Sensor you can monitor CPU usage, system health, and traffic of the host server. Similarly, with the Hyper-V Virtual Machine Sensor you can monitor CPU usage, and read/write values of virtual machines. PRTG Network Monitor is available as a free version or in multiple paid versions. The paid versions of PRTG Network Monitor start from a price of $1600 for 500 sensors to $10,500 for unlimited sensors. When it comes to Hyper-V monitoring, there are few tools that offer as rapid an experience as ManageEngine Applications Manager. 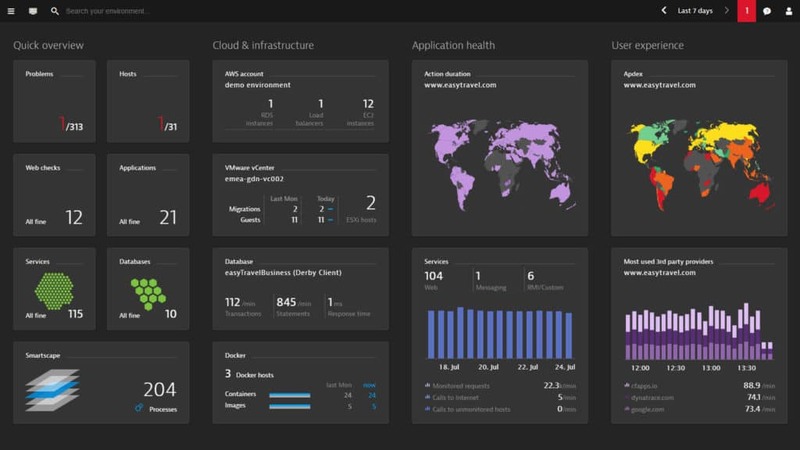 Whether you’ll need to monitor Hyper-V performance through the dashboard, generate reports, or alarms, ManageEngine Applications Manager has everything you could ask for. You can monitor the availability of Hyper-V services within your network. Metrics you can monitor with ManageEngine Applications Manager tool include total CPU utilization, Guest CPU utilization, hypervisor CPU utilization, and CPU utilization. You can even view an overview of your top Hyper-V servers to see which are consuming the most CPU (this is useful for indicating performance issues). It is worth noting that you can also use the GUI to enable, disable, and delete Hyper-V services from within the Hyper-V System Services window. 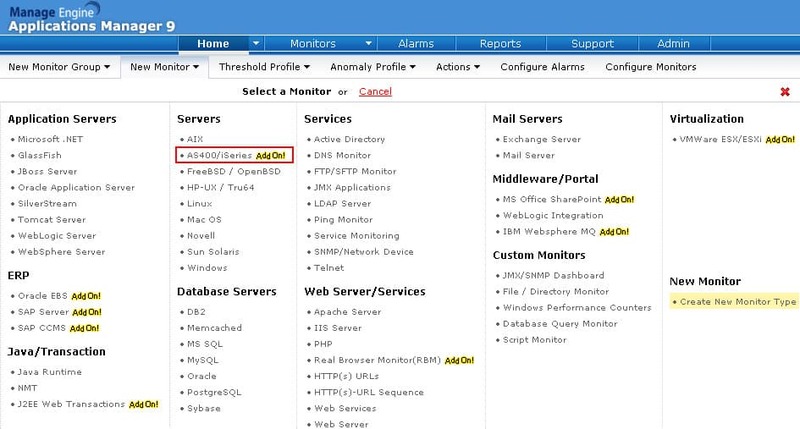 ManageEngine Applications Manager has a threshold-based alerts system. This means that you can configure alert thresholds so that you’re notified when CPU utilization goes over a specified level within a Hyper-V system. There are many different versions of ManageEngine Applications Manager you can purchase including a free version for those organizations monitoring less than five applications or servers. If you require more monitoring then you can purchase the Professional Edition starting from a price of $945 (£740). The next version is the Enterprise edition starting from a price of $9,595 (£7,518) for 250 monitors. You can also download the free trial here. Dynatrace is indisputably one of the most comprehensive Hyper-V performance monitoring platforms on the market. With Dynatrace you can view the performance of Hyper-V services right down to the virtualization and application layers. In other words, you can see the root cause of any poor performance that your infrastructure is experiencing. You can monitor all the necessary metrics to analyze the performance of your Hyper-V environment. Storage metrics monitored through Dynatrace include read/write, IOPs, and throughput. These metrics are crucial for helping you to know when to step in and address performance issues early on. The Dynatrace platform is also easy to use because it stays up-to-date when you add new infrastructure. 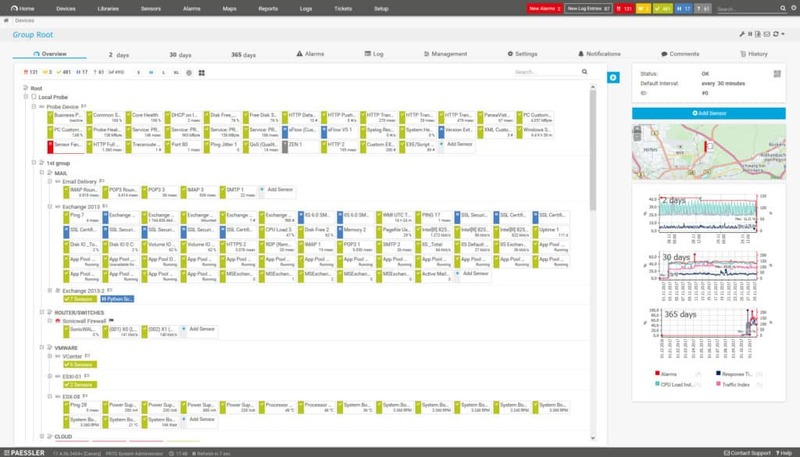 Dashboards and configurations are designed to automatically add new infrastructure so that you don’t have to waste time with manual configurations whenever you add a new device. Price-wise Dynatrace has a number of different options. There is an SaaS Pay-as-you-go modelwhich starts from a price of $0.035 (£0.027) per host/hour. There is also an enterprise version and a Web Scale version available as an on-premises or SaaS installation. In order to view the price of Dynatrace you’ll need to contact the sales team. You can download the 15-day free trial of Dynatrace. 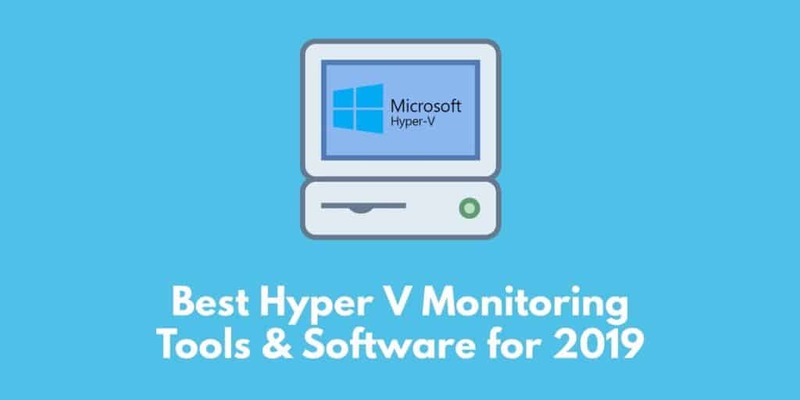 LogicMonitor has developed a reputation as one of the best performing Hyper-V monitoring platforms available today. 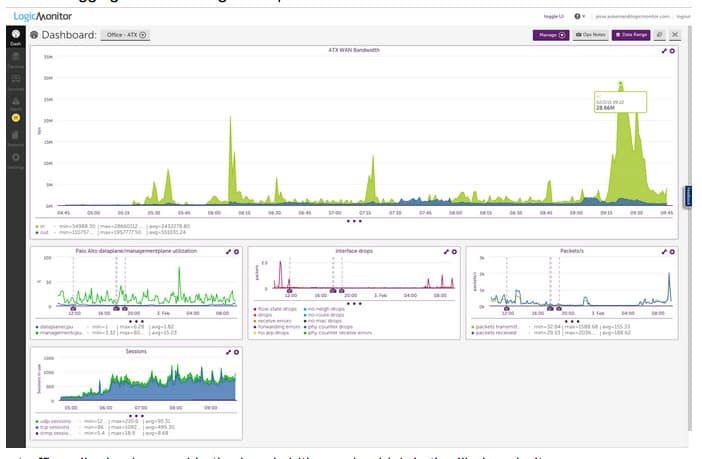 With LogicMonitor you can analyze hypervisor health and performance to see how well your network infrastructure is performing. Performance issues and bottlenecks can easily be identified with this tool. There is also a trigger-based alerts systemto keep track of bad performance when it occurs. These triggers are set by Microsoft engineering to ensure that you have the best monitoring setup for monitoring Hyper-V environments. For example, you will receive an alert if memory usage reaches a point that could cause performance problems. LogicMonitor is available as a Starter, Pro, and Enterprise version. The main difference between these three is that data retention ranges from three months to one and two years for each product. However, you’ll need to contact the sales team in order to view the price tag. There is also a 14-day free trial you can download here. Veeam One is a platform designed specifically with managing virtualized resources. You can monitor Hyper-V resources to look for the signs of poor performance and build information for troubleshooting. You’ll be able to tell how available your services are 24/7. Customizable reports help to build up the depth of your Hyper-V monitoring so that you develop more sophisticated insights. Veeam One allows you to create reports based on CPU, memory, network, and disk metrics data. However, you can choose your own configurations so that you see all the information you’ll need within the report. You aren’t limited to monitoring up-to-the-minute usage data either; you can forecast future usage as well. Veeam One forecasts your usage trends and helps you to implement capacity planning so that your usage doesn’t exceed the available space of resources. This ensures that your organization stays operational. Veeam One is available as four versions; the free version, Standard, Enterprise, and Enterprise Plus. The Enterprise edition is available for a price of $999 (£783). However, you’ll need to request a quote in order to view the price of the other two. The free version can be downloaded here. 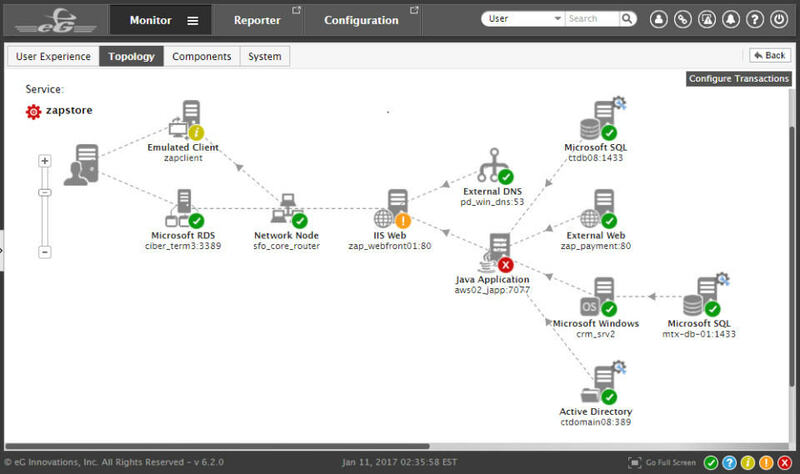 Quest Foglight is an infrastructure monitoring tool that provides users with a comprehensive view of the entire infrastructure stack. The platform has an autodiscovery function which identifies servers and virtual machines automatically so that they can be monitored. This is great because it means the user doesn’t need to configure anything. This tool has its own capacity planning feature, which anticipates how many resources you’ll need in the future. This ensures that even if your workload size increases over time, you’re prepared to adapt. In fact, you can even reserve capacity for future VM deployments so that your resources are fully prepared. Quest Foglight is available on Windows Server 2003, 2008 R2, 2012, 2012R2, and 2016. On Linux, Quest Foglight is available on CentOS, RedHat Enterprise, Oracle, SUSE, and Ubuntu. To view the price of this product you’ll need to contact the sales team directly. You can download the 30-day free trial of Quest Foglight. ControlUp is a network monitoring and troubleshooting tool that is designed to help you get to the root cause of performance issues in your network. ControlUp can monitor Hyper-V systems and provide users with full-stack visibility. All the user needs to do is install the ControlUp Agent and add a Hyper-V host as a managed computer. This sounds complicated but the configuration is actually very easy. Once the hosts have been added to ControlUp the platform will automatically configure settings that change based on whether the host is part of a cluster or solo. Once this is done you’ll be able to monitor your Hyper-V environment via the Hosts View which displays the real time performance of Hyper-V hosts. Metrics in the hosts section include vCPU, pCPU Ratio, CPU Usage %, Consumed Memory, Min Free Space Datastore, NIC Usage, Datastore R/W IOPS, Datastore R/W IOPS, Datastore Read Latency, Datastore Write latency, Datastore Read Rate Datastore, and Write Rate. There is also a range of metrics that can be used to analyze Hyper-V computers such as Disk Reads/sec and virtual Disk Read IOPS. There are three versions of ControlUp for purchase: Pro, Enterprise, and Platinum. For each of these products, you’ll need to contact the sales team directly to view a quote. However, there are volume discounts available as well. There is also a free trial that you can download here. Next up on this list we have eG Enterprise. eG Enterprise is a performance monitoring platform that is compatible with Hyper-V systems. Hyper-V metrics you can track with this tool include status of network interfaces, CPU, memory disk, virtual disk I/O activity, and space usage. eG Enterprise is web-based and available with agent or agentless monitoring. eG Enterprise is far from your run-of-the-mill Hyper-V monitoring software tool as it has its own root cause diagnosis solution. eG Enterprisehas automatic baselines for metrics that are designed to notify the user immediately once they have been breached. The moment unusual activity is detected, eG Enterprise’s diagnostics goes to work to find the root cause. The diagnostics feature looks through virtual machine to physical machine dependencies, application to application dependencies and virtual machine maps to find out exactly what is going wrong. This saves the user lots of legwork that would otherwise be spent trying to find out what the problem is. One advantage of eG Enterprise is that it can be deployed as an on-premises or cloud application. There are five main packages to choose from: easy evaluation, perpetual license, subscription, SaaS, and Audit Service. You’ll need to request a quote in order to view the price though. You can download the free trial from this link here. Finally, we have EventSentry. EventSentry is a network monitoring tool that can monitor Hyper-V hosts and the virtual machines running inside them. 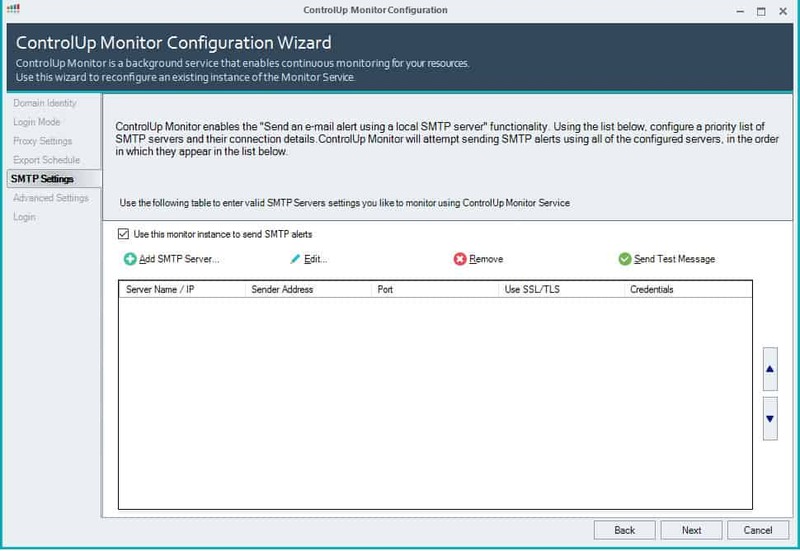 With EventSentry the user can monitor the health of connected Hyper-V systems. 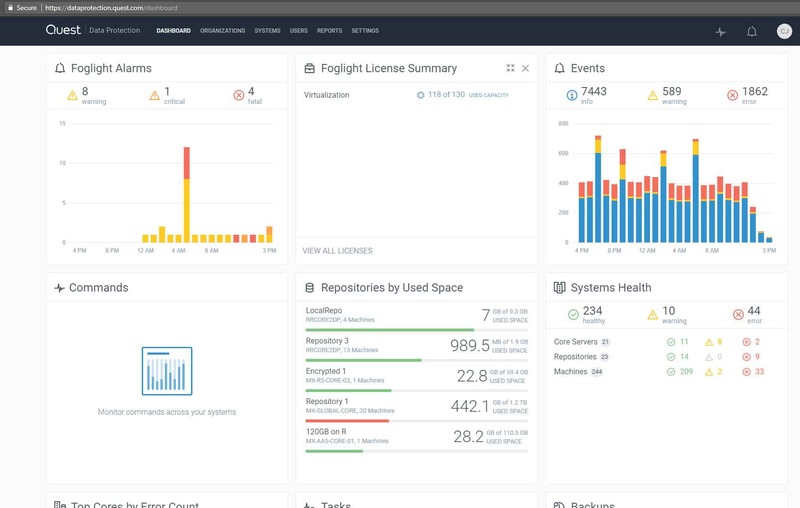 For instance, you can monitor disk space, event logs, services, and performance. The performance and disk space monitoring potential of EventSentry are this product’s greatest assets. 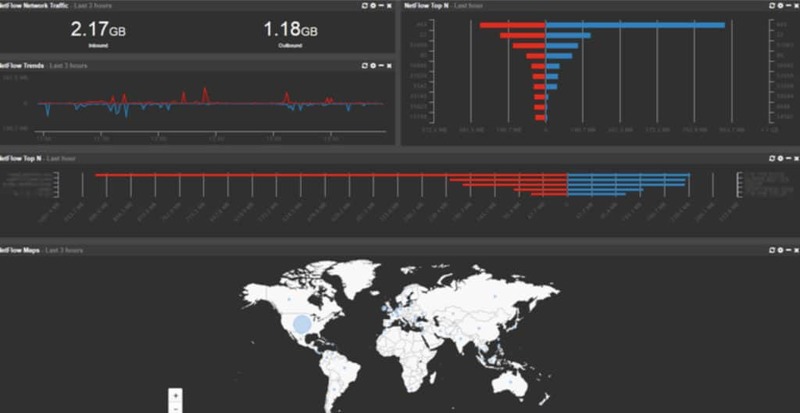 You can monitor the performance of Hyper-V environments in real time and historical analysis. With regards to disk space monitoring you can monitor a host’s disk space or individual directories. EventSentry is competitively priced for organizations of all sizes. The cost of a full license for one Windows Server or Workstation is $85 (£66) for the first year and $15.30 (£11.99) for every year after that. There is also a free trial version that you can download here. WhatsUp Gold is one of the best network monitoring platforms in the world, but it also has the capacity to support Hyper-V monitoring as well via the Virtualization Monitoring plugin. One of the features that make this product special is its ability to automatically generate a map of Hyper-V and VMware infrastructure. 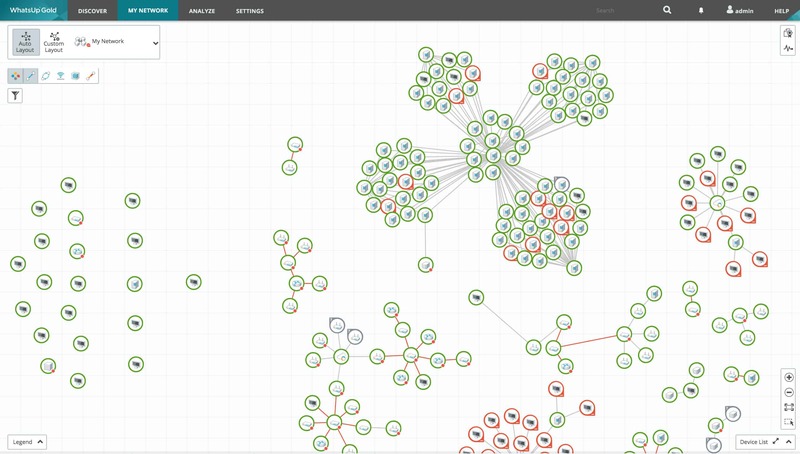 The map displays the relationships between hosts and guests as well as status and clusters. This is great for troubleshooting because it allows you to see how the environment is structured. In terms of performance metrics, WhatsUp Gold can monitor CPU, memory, disk, interface utilization, and availability. You can see exactly how your Hyper-V infrastructure is performing without needing to incorporate another third party tool. This program also has a thresholds-based alerts system. Alerts can be sent by email, SMS, or Slack to keep the user updated on changes to a variety of metrics included such as CPU utilization. By setting thresholds you can make sure that you keep up-to-date with everything you’ll need to monitor. In order to use the Virtualization Monitoring plugin you’ll need to purchase the Premium, MSP or Distributed edition of WhatsUp Gold. However, you must request a quote from the company directly to view the price. WhatsUp Gold is available on Windows Server 2008, R2, 2012, 2012R12 (64-bit), or 2016. There are many Hyper-V monitoring tools that can keep you up-to-date on system performance but the best tool on this list is SolarWinds Virtualization Manager. This tool has a simple GUI and alert system that will keep you on top of changes in performance. There is very little chance of you missing out on anything important with the dashboard of this tool. If budget is your primary concern then EventSentry stands in as an excellent choice. EventSentry is available for a much lower price than most of its competitors and still offers a first class Hyper-V monitoring experience. We recommend that you try out one or more free trials before making a purchase so you can see which program is right for your environment.